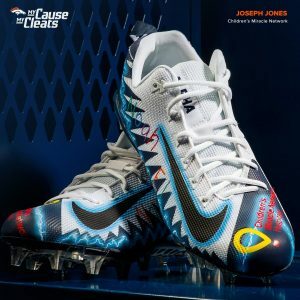 Hundreds of NFL players are supporting charitable causes over the next few weeks as part of the My Cause, My Cleats initiative. It was created in 2016 for NFL players to showcase the charitable cause that is most important to them to a national audience. This year, 15 NFL players selected local CMN Hospitals as their cause of choice during the campaign. Many of these players have personal ties with the hospitals and have visited and supported the patients treated there. These players are bringing awareness and funds to these local hospitals and making even more miracles happen in the lives of kids! You can bid on these special edition cleats and 100% of the proceeds will go to the player’s causes. Joseph selected to represent Children’s Miracle Network Hospitals during the campaign because he has a personal tie to children’s hospitals. Ogbonnia Okoronkwo, Linebacker–Children’s Hospital L.A.
Cole Toner, Offensive Guard–Children’s Hospital L.A.